Ubud’s first swim-up bar with a seasonal twilight cinema situated right in the heart of town, it’s a tounge-in-cheek neighborhood setting with private daybeds, teepees and decks line the pool with food range from vegetarian to grill and drinks from craft options to classics. We're open daily from 9 am to 10 pm. So, it’s just you and your best bud? Or are you a group of island hoppers? Spot grabbing made easy using the button below or call us at +623619080888. Enjoy your time in Ubud. Choose your preferred spot at our verdant spaces be that in our private daybeds and teepees, sun decks and lush pergolas, poolside lawn and picnic bale, or in our super chill loungers, we surely will make the most of your Ubud downtime. We fill up superfast, so book your space early to avoid letdowns. Lining up the pool are the 3 private daybeds and 3 teepees and they are perfect for a group of friends or family who want a little bit of privacy. Each has a maximum occupancy of 4 adults or 2 adults and 2 children. Priced at IDR 350.000 net for each daybed or teepee, choose your date to book them here. Sofas and chairs under the lush pergolas are perfect for bigger groups to enjoy a delicious lunch or dinner, pergolas are free to access. Book a table here. 10 loungers looking over the entire space are located at the mini theatre deck with a single person seater is priced at IDR 150.000 net and IDR 250.000 net for a couple; a bale (divan) is located at the corner of the lawn area suitable for 4 adults or 2 adults and 2 children priced at IDR 350.000 net, choose your date to book them here. A two-seater cozy sofas and single pool chairs are located at the lawn area facing the pool, they are free to access. Book a spot here. A table of 4 with reeds umbrellas are decked on the other side of the pool across from daybeds and teepees. They are perfect for a group of four people or less with direct way in to the pool, all are free to access. Since there are only four sun deck spots, you might want to book early here. Tables for lunch or dinner groups are set inside the Joglo House located near the entrance along with the bar looking over the pool, Joglo House is free to access and a perfect space for the non-smokers. Book them here. Our food menus range from the authentic Indonesian taste to house signature dishes, from international cuisines to vegetarian or vegan options, from the popular single-portion bowls to scrumptious meals portioned for group of friends, so dig in because our tables are open for breakfast throughout dinner. Our food options serve up considerably fresh and tasty of local and international favorites including the house popular signatures. 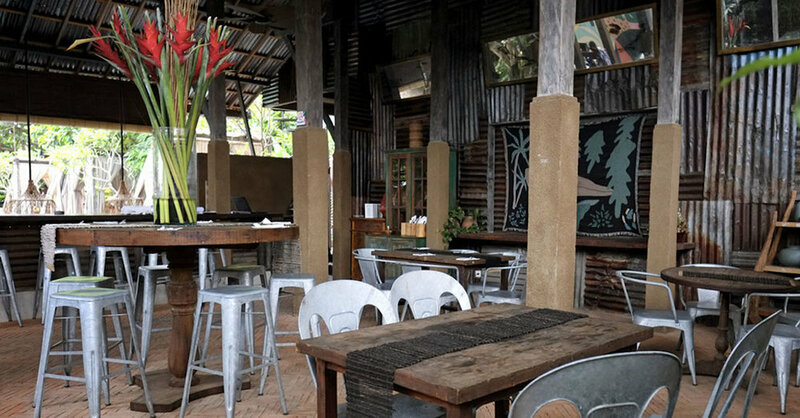 Without a question, we’re Ubud one stop culinary adventure spot. View menus. Easily order from your cozy space or swim over to the bar for our extensive option of beverages from craft drinks to healthy smoothies or go for the refreshing mocktails and sip away through the sunset some of the cocktail classics. View menus. Check out our poolside fun affairs of themed dinners, popcorn club’s twilight cinemas, major summer events, and end of year holiday festivities. We also accommodate group gatherings, send us your inquiry to hold a private event. Show off your singing skills and hit that super high applause meter ! Join the team for one romantic poolside dining experience under the brightest moon. Twilight cinemas by Popcorn Club. Friday: A Star is Born starring Lady Gaga, Bradley Cooper, and Sam Elliott. If arriving by car, please note that there is no parking on Jalan Monkey Forest. Guests can park in Ubud Central Parking located near the Monkey Forest and we are located just 7 mins walk from there. If arriving by motorcycle, we have a bike parking down the lane beside Liap Liap which leads to our entrance. Drop us a message about an inquiry or just to say Hello. Remember to follow and tag us your fun posts during your time at Folk to be featured on our Instagram.